Here is Chango, senior kitty. More feral than domestic. 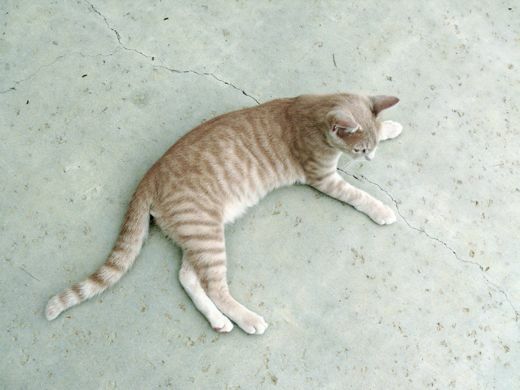 Prone to skittish-psycho behaviors. A survivor with a soft heart, but heavy paws. 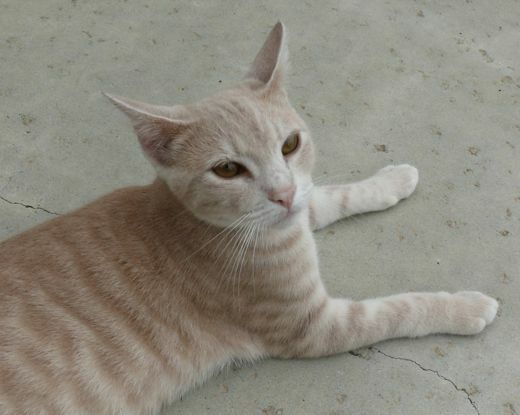 He has been our Chango kitty since the year 2000. Next to him is the newbie, Ferris. He gives hugs and kisses. He stays a safe distance from Chango, but he torments Benjamin Franklin mercilessly. He has enough kitten energy to last him all day and he uses it. Zoltar. The cocky-little-dude. He is small and he is feisty. He is getting in fights, and picking on small children. His days are numbered, but he's got a high number, because I love him, and he loves me. 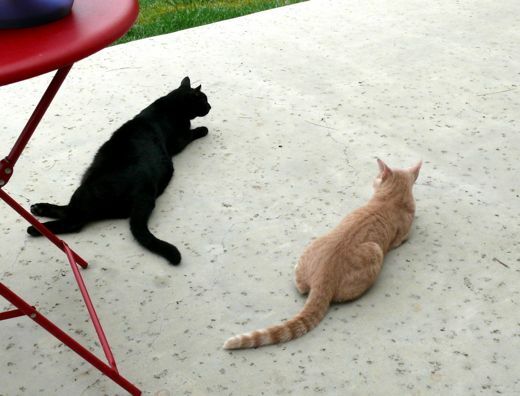 Chango and Benjamin Franklin Thunder-Cat leave the chickens alone. They leave all the chickens alone. 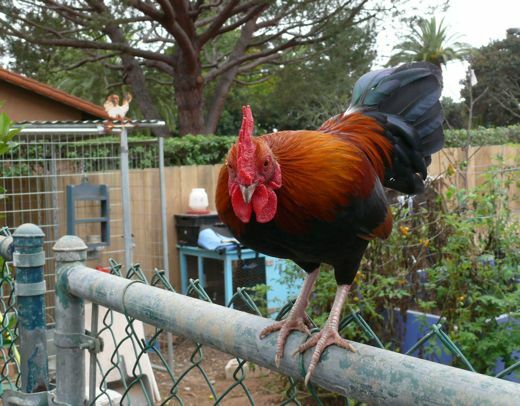 They do not pester, torment, ruffle, disturb, or annoy the chickens. I don't know if this learned, or good instincts. I don't know if Chango and Benjamin Franklin Thunder-Cat simply have good manners and a healthy respect for their fellow Bird House pets, but it does work out nicely, the peaceful accord they have drawn with the chickens. But this one. This one has no sense about chickens. Those feathered playthings pecking in the yard are the sirens that call his soul to the hunt, to predatory and murderess purpose. He watches them from the door, from the window. 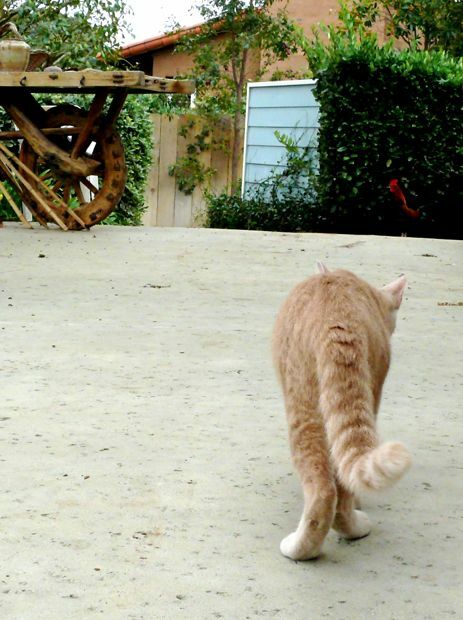 He tracks the chickens as they graze across the lawn. His lips part and quiver in tasty anticipation, of what he believes is his entitlement: Chicken Dinner. And when he can get out... oh dear. 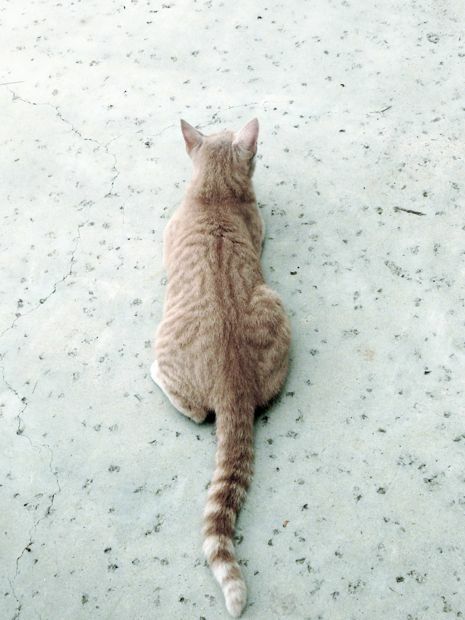 When he is out, he is stalking those birds, with evil intent, and a steadfast tread. He used to sprint and leap right for them, but he soon learned that his galloping paws betrayed him, and the chickens scattered and clucked and expertly evaded him. Now he is a stalker. No less purposeful, no less intent, just slower, quieter, more candid. He makes a display of casual indifference. With Zoltar still fixed in his sight, he feigns a drop, he stretches, he shows his disinterest, his detachment from chicken chasing. You are a sly one Mr Ferris. But you have much to learn. Much. 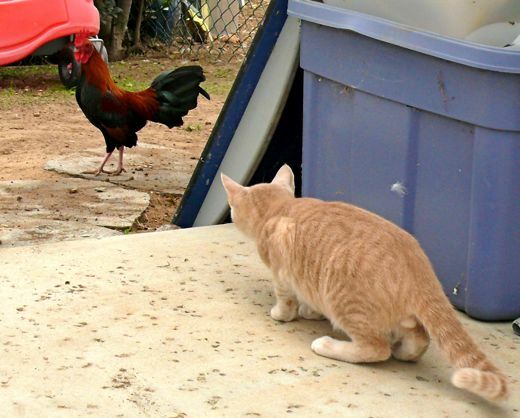 Chickens do not look kindly on pesky kittens. 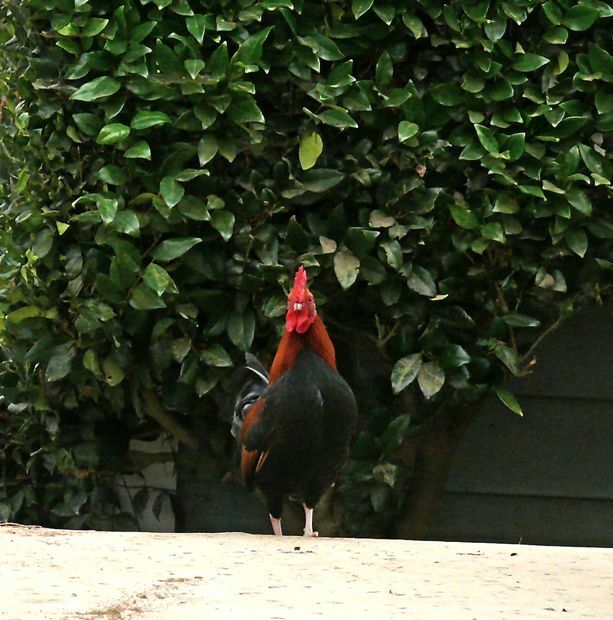 Chickens have a mean kick in them, and roosters have instincts too... to watch for predators, to protect their flock. Oh kitty. You are a sly one Mr Ferris. But you have much to learn. Much. And Zoltar, or Temple, or even Betty, will be knocking you on the head if you don't give this up. Small. Fast. Cocky Zoltar. I hate to give him up. He rides around the yard on my shoulder, and he is the easiest to pick up and hold. But he is cocky, and he and Temple have been fighting... I could charge admission. 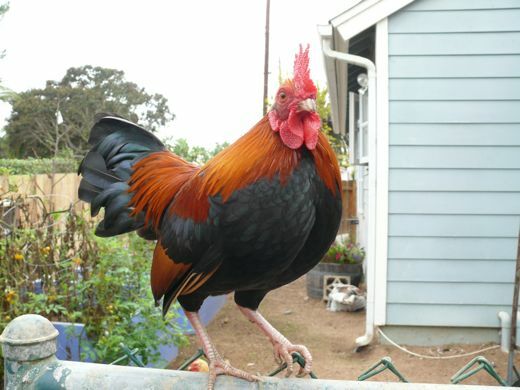 He needs a new home, where he can roam and defend his hens and crow. He is not destined for a stew pot. He's much too handsome, and besides he wouldn't amount to more than two or three chicken nuggets. Sorry Zoltar. Just keeping it real. As for this cocky little dude. He is with his physician right now. Yup. It's time for the snip-snip. I think the chickens will be safe this week. Sorry Ferris. Just keeping it real. We talk a lot, it seems -- Dean and I -- about animals' animal-ness. The predator and prey relationships, the way our feelings about inherently appropriate behavior changes once we bring animals into our midst, into our family (as do our feelings about our OWN place in the great circle, and what we feel comfortable -- or not -- eating). Perhaps Ferris' alteration will change his tendencies but maybe not; I do respect how chickens are able to defend themselves, though! 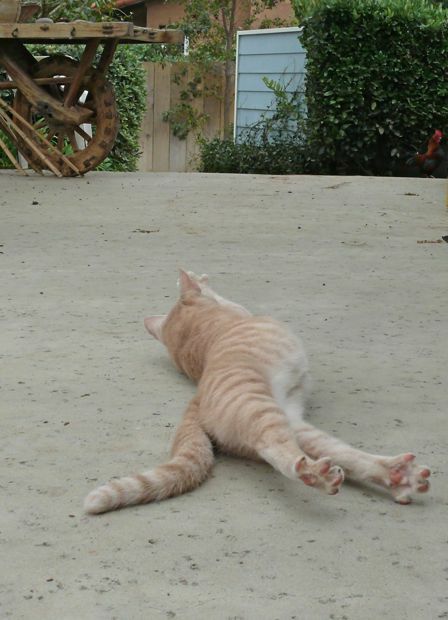 Both of my cats have a healthy respect for my chickens. Maggie stays away most of the time, but Joey will lay in their midst and the girls ignore him and him them. Zoltar is gorgeous, and Ferris better watch himself. He may or may not calm down after his little trip to the snip-snip doc! Predators and Prey... endlessly fascinating. I always feel amused when watching a Nature episode... depending on who is featured, the sympathies always go to the *star* of the week. We want the cubs to survive winter, but then the next week we are cheering for the antelope to escape those grown-up cubs! Ferris has much to learn, indeed! Sassy had the same interest in my hens until she grew up a bit. She's almost a year old now and has toned down the sassiness quite a bit, thank goodness. The other three cats express no interest at all in the hens. Lucy, the bird dog springer spaniel, is totally intimidated by them. When she lies down in the yard, they come to inspect her and peck at her spots. Silly chicas! Those aren't bugs!